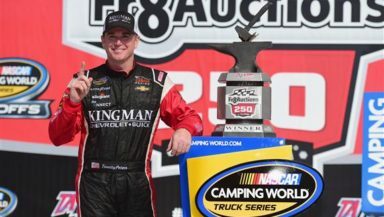 TALLADEGA, AL - OCTOBER 13: Timothy Peters, driver of the #25 Kingman Chevrolet Chevrolet, poses with the trophy after winning the NASCAR Camping World Truck Series Fr8Auctions 250 at Talladega Superspeedway on October 13, 2018 in Talladega, Alabama. Photo by Jared C. Tilton/Getty Images. The final race in the Round of 8 for the NASCAR Camping World Truck Series took place Saturday afternoon in Talladega, Alabama and as always, it proved once again anything is possible and nothing is over until the checkered flag falls. This was the case for Timothy Peters who earned his third win at Talladega Superspeedway after an incident with leader Noah Gragson on the last lap. David Gilliland and Spencer Gallagher set the front row in qualifying late Friday afternoon. The first stage was 20 laps and it went green without any incidents. Playoff driver and Las Vegas winner, Grant Enfinger, took the checkered flag in the first stage. There were some issues on pit road, however, as David Gilliland was penalized for pitting outside the box and given a one lap penalty. The No. 16 of Brett Moffitt was penalized for an uncontrolled tire. Stage 2 took place on lap 25-lap 40. Like the first stage, there were no incidents until Moffitt and Austin Hill had damage in the remaining laps. This time, David’s son, Todd Gilliland, won Stage 2. The third and final stage began on Lap 45 with 48 to go and it saw several incidents all the way to the checkered flag. It started on Lap 48 when Tanner Thorson spun on the backstretch to bring out a caution. Then the expected big one was seen with 35 to go. The No. 47 of Chris Fontaine was clipped by the No. 24 of Justin Haley, which saw Fontaine go back up the track and several others were involved including John Hunter Nemechek, Ben Rhodes, Justin Fontaine, Bo LeMastus, Parker Kligerman, Matt Crafton, and Johnny Sauter. During the pit stops, Enfinger was penalized for removing equipment (a gas can). After a red flag, the restart came with 31 laps to go. Austin Hill was penalized for passing Jennifer Jo Cobb underneath the yellow line. Enfinger took the lead with 22 to go. As laps were winding down, playoff hopeful, Moffitt had a flat right rear and had to make a pit stop. With 12 to go, Todd Gilliland was spun and hit the inside wall after contact with Enfinger. This saw the race resume with six to go. Gragson was out front trying to hold off the field for his first win since Kansas in May. However, too many trucks had good runs and there was aggressive pushing. On the last lap, Gragson was turned by eventual race winner Timothy Peters. Gragson’s truck got air and others started wrecking as well. NASCAR had no choice but to throw the caution. Peters was in the right spot at the right time to take home his 11th career win, his third at Talladega. It was his last race of the season in the No. 25 GMS Racing Chevy. Johnny Sauter, Brett Moffitt, Noah Gragson, Grant Enfinger, Justin Haley, and Matt Crafton all move on to the Round of 6 that begins at Martinsville Speedway Saturday, Oct. 27. Ben Rhodes and Stewart Friesen were eliminated from competing for the championship.